Opening Day in Houston went beautifully. 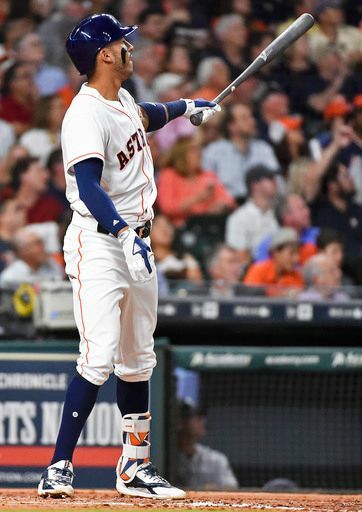 The Astros got a first-inning home run from George Springer, and in the spirit of tradition; Felix Hernandez looked aged and gave up a monster home run to the other team’s star on Opening Day. Usually this is a spot held by Mike Trout, but Carlos Correa hit one completely out of the stadium to the tune of about 450 feet. As they like to say ‘it hit the train tracks’ at Minute Maid. This was the first game played at The Juice Box without that strange Tal’s Hill in center. Dallas Keuchel was splendid. Alex Bregman got in on the act. The Astros are 1-0 and it felt a lot like last year’s opener in that they look like they have all the makings. But the exclamation point on the night was Correa’s monster bomb.